Saudi Arabia’s execution spree has seen 100 people put to death this year alone. The country is already one of the most prolific executioners in the world, and they’re showing no signs of slowing down. Since just July, they’ve been executing five people a week on average. For too long now the Saudi authorities have been using the death penalty as a tool to crush dissent, showing a callous disregard for human life. This has to end. Too many people in Saudi Arabia are sent to their death following court proceedings that routinely fall short of international fair trial standards. They are often convicted solely on the basis of “confessions” extracted through torture and other ill-treatment. They can be denied legal representation in trials which are held in secret, and are sometimes not kept informed of the progress of their case. What’s more, Saudi Arabia uses the death penalty as punishment for a wide range of offences, including those not accepted as the “most serious crimes” under international human rights law, which are limited to crimes involving intentional killings. We are opposed to the death penalty in all situations – no exceptions – and we won’t stop fighting until it’s confined to history forever. If you’re with us, join our campaign to stop the execution of 14 people in Saudi Arabia who have been sentenced to death by beheading. 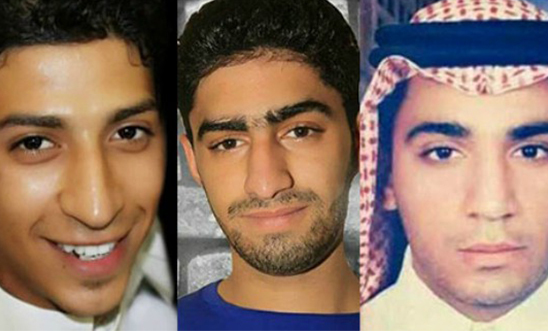 The men, three of whom are pictured above, endured a grossly unfair trial based on confessions extracted by torture, and they could be executed at any moment. Over 50,000 people have already showed their support, but we need as many people to raise their voice as possible. Take action now.